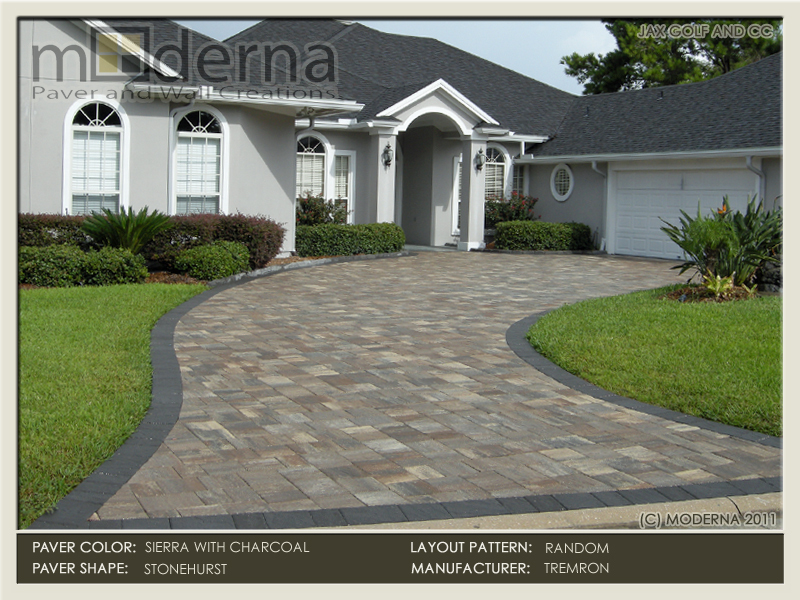 Jacksonville Paver driveway installation by Moderna. THis drive features the new textured Stonehurst paver style. Sierra pavers on the field, Charcoal border. A raised paver patio overlooking the lake. This patio featured Belgard's Bergerac paver in the Oak Run color. Blends of White, Tan, and Charcoal. Paver Driveway in Jacksonville FL. Mega Olde Towne pavers in a random pattern with a 3 piece border. Sand Dune color. A brick paver walkway featuring 4 x 8 pavers in a traditional 45 degree herringbone pattern. The color used is Heritage- Red, Tan, and Charcoal. A large brick paver courtyard area. Pavers are a mixture of 12 x 12, 18 x 18 and 4 x 8 Plaza series pavers from Tremron. Olde Chicago color. Jacksonville FL. Jacksonville paver walkway construction using the Bergerac premier paver from Belgard. This paver is textured and tumbled creating an antiqued look. A brick paver driveway installation in Orange Park FL. This drive features a double Charcoal soldier course and an added parking area in the back. A circular paver pattern makes up the transition from the driveway into the walkway of this Orange Park home. There is a mixture of colors used. The Decor shape has been discontinued recently- A popular paver shape several years ago. This Jacksonville driveway features Olde Chicago with a Coral border. We created this ramp for wheelchair access from the lower patio to the raised pooldeck area. The design incorporates a raised curb throughout. Brick paver driveway, walkway, steps & entryway. This is an Oldcastle Harvest blend 2 piece Appian combo with a 6 x 9 Border. A paver patio featuring Oldcastle's 2 piece Appian combo style paver in Amaretto. The pavers are installed in a T pattern. St Johns County. The tiered retaining wall makes a nice plant bed and handles the slope of this backyard nicely. The retaining wall is Anchor Highland. An elegant seat wall wraps a raised circular paver patio on this golf course home in Marsh Landing. The Fire pit is plumbed with gas and a remote igniter. Raised paver patio with a cedar pergola and outdoor kitchen. The pavers are Sand Dune color and retaining Wall is Carbondale color. A large paver patio raised by retaining wall surrounded by new landscaping, lighting, and irrigation re-work. The pavers and wall are Sierra color. A paver patio and steps in this Nocatee home. Nocatee is know for heavily sloped backyard that require wall and fill to utilize a large patio. These hardscape steps lead to a paver walkway and out to the dunes on this Oceanfront home. The wall and step treads utilize tumbled material. Multiple paver styles are mixed to achieve this look inside a new screen room in Oprange Park FL. A summer kitchen is on the left of the photo. Teak dining set on this paver patio in Jacksonville FL. The pavers are Mega Olde Towne in Sierra color. A seating wall on the far side. This elegant pergola was built over the custom summer kitchen and paver patio. Uplights built into the pergola illuminate the cooking and eating areas. Hand crafted cedar pergola over an outdoor kitchen and hot tub area. The upper pavers are Mahogany Ash. The lower pavers and wall are Timberwood. A small stone patio in Ponte Vedra Beach FL. The pavers are Olde Towne Riverwood and wall is Tan in color and tumbled Stonegate style. A small paver patio with retaining wall. The field and wall color are Sierra. Sandstone blended with Tan and Charcoal. The border is solid Charcoal. A brick paver step and walkway using the Mega Olde Towne pavers with a 6 x 9 border. The Field color is Olde Chicogo with a Charcoal border. A large paver project consisting of a new pooldeck, patio, driveway, walkways, seat wall, kitchen and fire pit. All pavers are Sierra.